Big Fish Casino has added a new VIP slot machine to their lineup: Jackpot Shanghai. This is another slot machine in the same style as Jackpot City Deluxe. Hit 4 or more gold coin symbols to trigger the Stick & Win bonus. 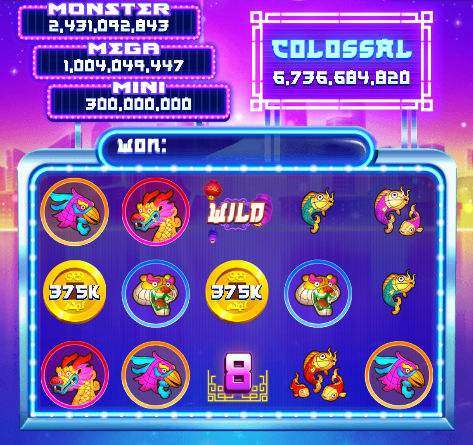 If you happen to fill all of the reels with gold coin symbols during the Stick & Win bonus, you’ll win the colossal jackpot. Like Jackpot City Deluxe, all jackpots are won inside the Stick & Win bonus round: Mini, Mega, Monster, and Colossal. For more details on this machine, including payline information, min/max bets, and more, check out the Jackpot Shanghai page. This slot machine is available only to VIPs Tier 4 or higher at this time. Not a VIP yet? A purchase of $10 or more will automatically give you all VIP Tier 4 benefits including this slot machine, but if that’s not your thing, it should be available to all players within a few weeks. Stay tuned. Have you played yet? Check out the new slot machine using the links above, and then let us know what you think in a comment below.